Kromski and Sons is a family business. Three generations of Kromski’s have worked with wood and learned the craft of wood turning, a skill they have elevated to an art. Leon Kromski began a turning business in 1918 and operated it until 1939 when the impact of WWII and Communism made it impossible to continue. His son, also named Leon, having mastered turning from his father, resurrected the craft and the business in 60’s by producing the first of a line of spinning wheels. Today the family business is continued by Leon’s sons : Wojciech Kromski – the engineer for wood technology; and Daniel Kromski – the artist and designer of the current line of Kromski products. 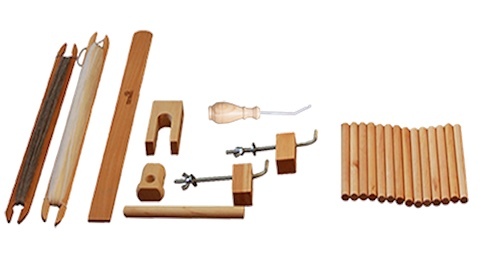 In 2001 we developed and produced a very popular rigid heddle loom, the Kromski Harp. We also manufacture accessories for spinning and weaving, such as spinning stools, niddy noddies and shuttles. We have extensive experience with all types of wood turning and produce other turned items including balls, post caps and finials. Kromski & Sons operates in many markets and is known world-wide for their spinning wheels and looms, exporting products to Europe, North America and Japan. The Kromski’s take pride in providing spinners and weavers world-wide with high quality, well engineered spinning and weaving tools that not only operate at modern standards but also have a design and architecture that enhance the lives and surroundings of their customers. Form and function come together in the hands of a Kromski artisan and the results are a sight to behold, use and own. Ephods & Pomegranates are proud to be an authorized Dealer for Kromski Rigid Heddle Looms and Loom Accessories.